People want to develop, but sometimes they need the chance to use their talents. Looking back on your life, can you think of somebody who gave you a realistic but stretching opportunity to succeed? Perhaps it was a teacher at school, a coach in sports or a manager at work. How did they give you this opportunity? What did you do right to grasp it? Looking to the future, how can you give somebody the chance to succeed? Let’s explore some steps towards making this happen. Everybody has talents. The art lies in seeing what these talents are and then spotting the opportunity where somebody can succeed. Many years ago I witnessed the power of giving and grasping such possibilities. Isak, a 15 year-old Swede, spent a fortnight staying at our home. He travelled with the tools of his trade, equipment for fire juggling. His visit coincided with our neighbour holding their annual fireworks display to which around 50 people are invited. We arranged for Isak to give a fire juggling performance to the gathering. He proved sensational. Lighting balls of fire, he whirled them around in hypnotic patterns, whilst incorporating moves from capoeira, the Brazilian martial art. The crowd loved it. In their eyes, this shy boy turned into a budding star. But for me one event stood out. Before the performance, he spent one hour practicing in the garden to make sure he got it right on the night. Isak went on to study at clown school and earn a living entertaining people around the world. Everybody has gifts, but these may not be recognised by the educational or work system. Their strengths may fall outside the boxes drawn by conventional views of exam subjects or competencies. Can you think of somebody who has the talent and drive required to succeed in a specific activity? What are the things they do that suggest they can succeed in this activity? 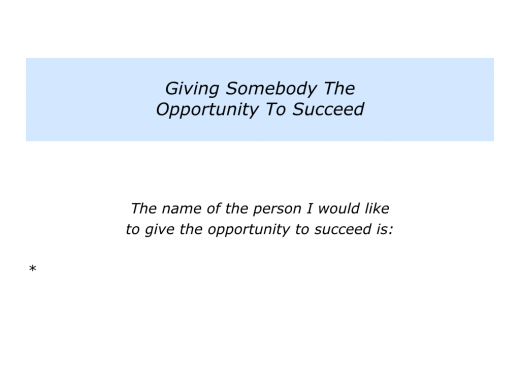 Describe a person who you would like to give the opportunity to succeed. 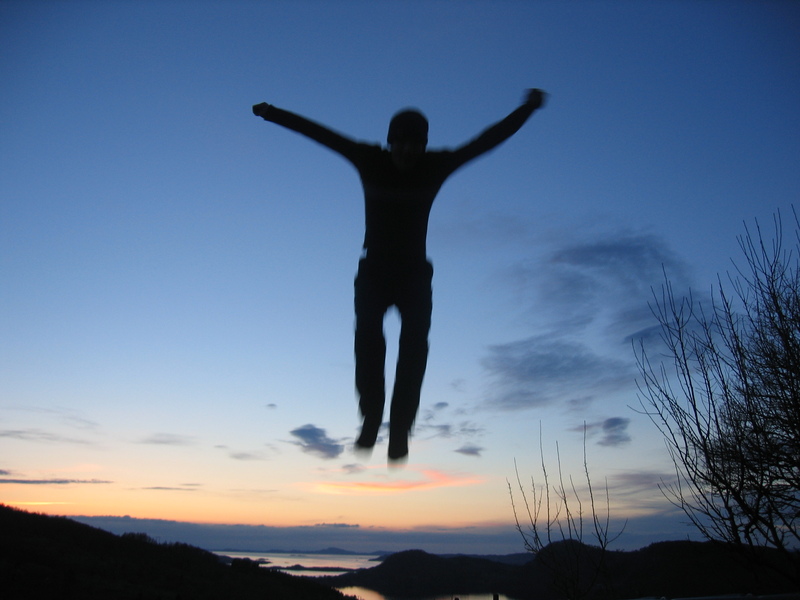 Describe the specific activity in which you believe they have the talent and drive required to succeed. Describe the specific reasons why you believe they have the talent and drive required to succeed. “The best way to learn is to teach,” said Tony Manocchio, one of my mentors. He went on to explain an opportunity he wanted to offer me. Tony gave me the opportunity to teach at the age of 28. This was quite old for a starting teacher, but I was younger than all the visiting psychiatrists. Fortunately the session worked well and produced invitations to teach in Scandinavia. This eventually turned into a full-time career for 10 years. I am not sure what Tony spotted, but he provided the practical opportunity to succeed. This opened the door to massive possibilities. Let’s return to the person whom you believe has talent. Can you think of a suitable opportunity they can grasp? It can be one that exists already or one you can create. 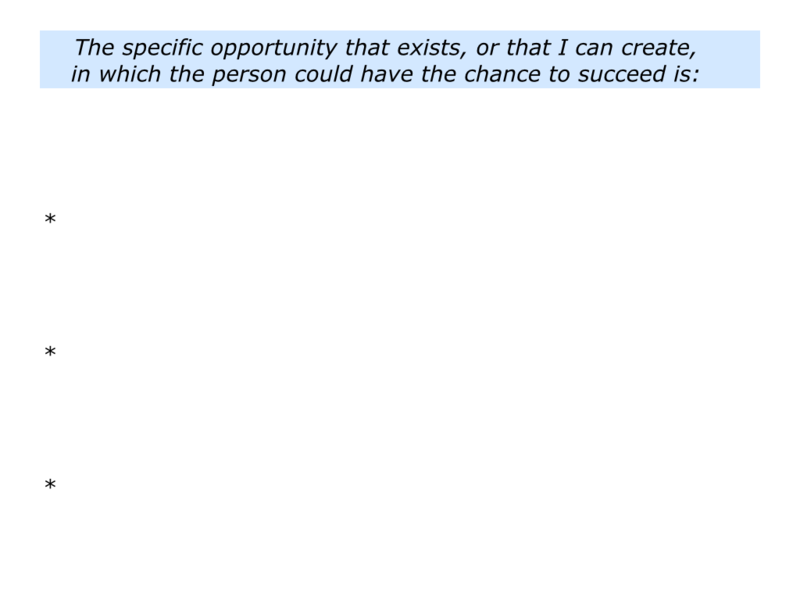 The opportunity should be stretching but, providing they work hard, also provide a realistic chance of achieving success. If you wish, try completing the following exercise. This is the crucial part. Great educators, for example, focus on encouragement, enterprise and excellence. They provide an encouraging environment and look for when the person shows enterprise. They then work with the learner to help them achieve excellence. Let’s return to the person you want to support. You can provide appropriate encouragement, but it is vital they take responsibility. Some well-intentioned people may be tempted to be over-supportive and smother the learner. The person must be allowed to plan, work hard and achieve their own success. What can you do to provide the right kinds of support? What must the person do to take responsibility? 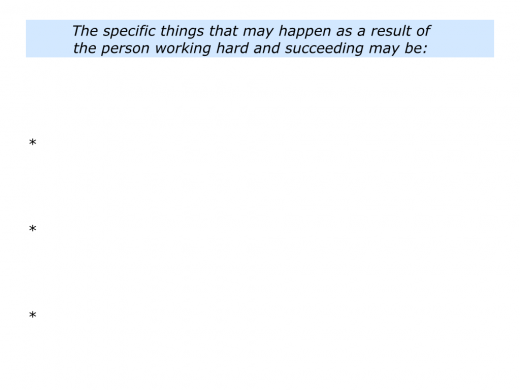 What may be the results of them working hard and succeeding? 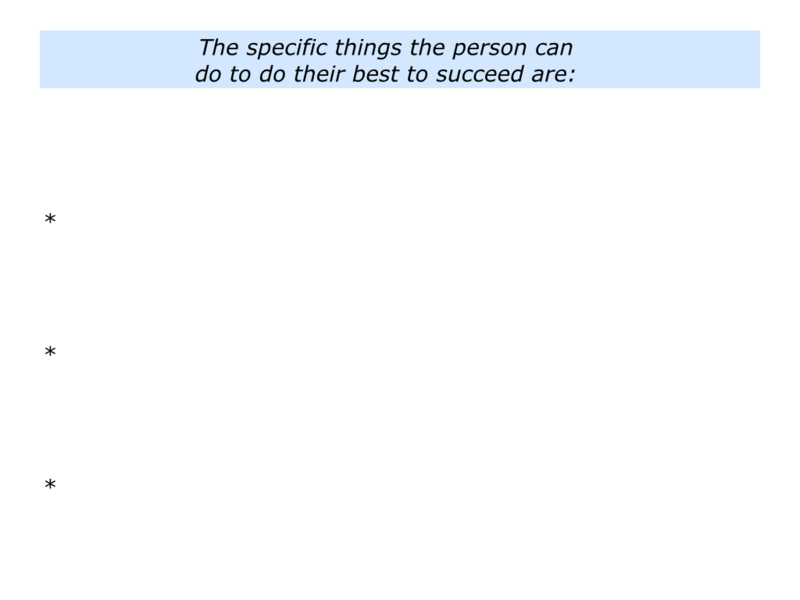 Describe the specific kinds of support you can give to help the person to succeed. 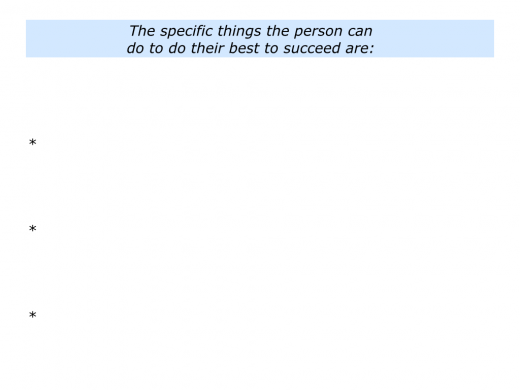 Describe the specific things the person can do to do their best to succeed. 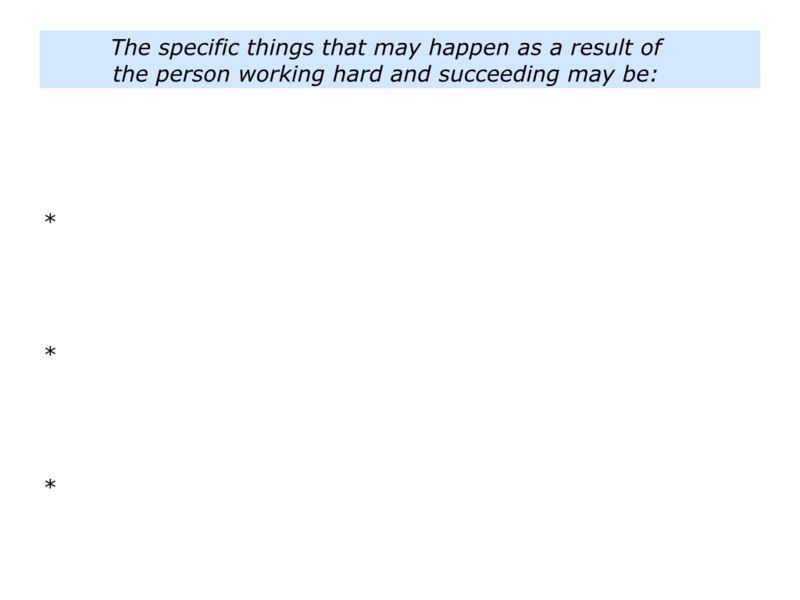 Describe the specific things that may happen as a result of the person working hard and succeeding.